Manticore has learned that the universe is not a safe place, but the Star Kingdom’s enemies are about to learn it's dangerous to mess with the Manticore! With over eight million copies of his books in print and thirty titles on the New York Times bestseller list, David Weber is the science fiction publishing phenomenon of the new millennium. In the hugely popular Honor Harrington series, the spirit of C.S. Forester’s Horatio Hornblower and Patrick O’Brian’s Master and Commander lives on—into the galactic future. Books in the Honor Harrington and Honorverse series have appeared on fourteen best-seller lists, including those of The Wall Street Journal, The New York Times, and USA Today. While Weber is best known for his spirited, modern-minded space operas, he is also the creator of the Oath of Swords fantasy series and the Dahak saga. Weber has also engaged in a steady stream of bestselling collaborations including his Starfire series with Steve White, which produced the New York Times bestseller The Shiva Option among others. Weber’s collaboration with alternate history master Eric Flint led to the bestselling 1634: The Baltic War, and his planetary adventure novels with military science fiction ace and multiple national best-seller John Ringo includes the blockbusters March to the Stars and We Few. Weber’s collaboration with Linda Evans and Joelle Presby produced the bestselling Multiverse series. David Weber makes his home in South Carolina with his wife and children. Timothy Zahn is a Hugo award winner and author of the #1 New York Times best seller Heir to the Empire. Born in Chicago, Zahn earned a B.S. in physics from Michigan State University and an M.S. in physics from the University of Illinois. He sold his first story to Analog magazine in 1978 and immediately attracted attention as a new writer of science fiction based on real, cutting-edge science. Other Zahn works include the Conqueror and Dragonback series. 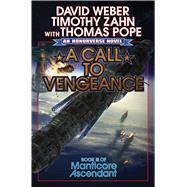 His books for Baen include his popular Cobra SF adventure series, with latest entry Cobra Traitor, and now the Manticore Ascendant series, cowritten with David Weber and Thomas Pope. Thomas Pope is a founder of BuNine, a collection of professionals assisting David Weber in defining and documenting the Honorverse. Tom served as lead editor for House of Steel and is collaborating with David and Timothy Zahn on a new series set in the early days of the Manticoran Navy. He lives in Pittsburgh with his wife, two children, and a constantly growing menagerie of pets.